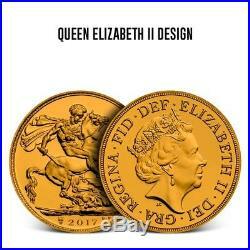 8-Piece Great Britain Gold Sovereign Coin Design Set – Eight Different Types! About Gold Sovereigns First introduced in 1489, the Gold Sovereign has become one of the most famous and collectible coins in world history. The gold coins were first minted under the rule of King Henry VII. Each coin had a nominal value of one Pound Sterling and weighed about half an ounce. Gold Sovereigns were originally issued in 23-carat gold (95.83% pure), but the composition was modified to 22-carat gold (91.67% pure). The latter is the same alloy used to produce American Gold Eagles. The British Empire established numerous mint branches around the world, each producing large quantities of Gold Sovereigns. However, many of these coins were pulled from circulation and melted down over the years. By the 1940s, Gold Sovereigns had shifted from being circulated coins to becoming a bullion item. In fact, the UK continued producing them as bullion pieces. These coins remain one of the world&###x2019;s preferred means of owning gold. About This Set Provident has compiled a number of sets of all eight major Gold Sovereign designs issued from the 1830s to today. 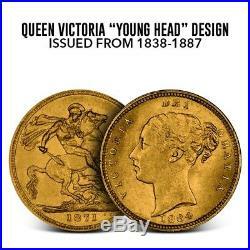 Queen Victoria &###x201C;Young Head&###x201D; design (issued from 1838 to 1887). 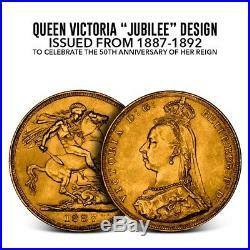 Queen Victoria &###x201C;Jubilee&###x201D; design (issued from 1887 to 1892). 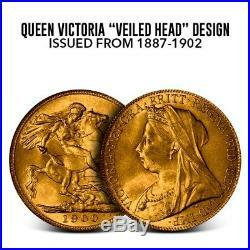 Queen Victoria &###x201C;Veiled Head&###x201D; design (issued from 1887 to 1902). King Edward VII design (issued from 1902 to 1910). 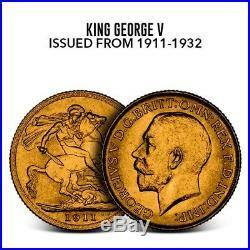 King George V design (issued from 1911 to 1932). Queen Elizabeth II &###x201C;Bare Head&###x201D; design (issued from 1957 to 1968). 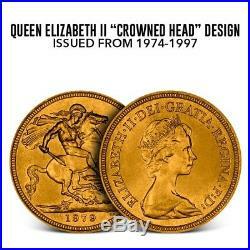 Queen Elizabeth II &###x201C;Crowned Head&###x201D; design (issued from 1974 to 1997). Queen Elizabeth II Tiara design. At Provident, our primary goal is to make it simple and safe to invest in precious metals. We sell only genuine bullion products sourced directly from the mints that produce them, such as the US Mint, Royal Canadian Mint, Perth Mint, and more. In addition, our inventory holds a unique mix of products that you can only find at Provident. Additionally, our team is committed to offering exceptional customer service at every step of the investing process. You can rest easy knowing that you will get exactly what you ordered each and every time. All packages are fully insured during transit. Will I receive the exact item pictured? All photos are stock and are meant to represent the type and quality of item you will receive. What is spot price? Spot price is the market value of precious metals at a given point in time. How are prices calculated? Nearly all products in our store are priced at a premium or discount to the spot price. As spot price moves up and down throughout the day, so will the price of the product. How often are prices adjusted based on spot price? Similarly, our traders are NOT commissioned. What you see is what you get. Can I cancel my order? Cancellations are considered on a case-by-case basis. Is there a minimum order? There is no minimum order. Can I change my order once it has been placed? No changes can be made to the items included in an order once it has been placed, but a subsequent order can be placed. Yes, you can apply those monies at checkout. Will my order be insured? First off, we are sorry this happened. That said, it does happen, but we will make it right. We always do our best to do right by our customers. Not at this time. How long will my order take to get to me? View more great items. This listing is currently undergoing maintenance, we apologise for any inconvenience caused. 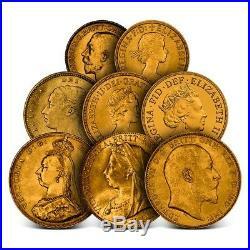 The item “8-Piece Great Britain Gold Sovereign Coin Design Set Eight Different Types” is in sale since Friday, May 25, 2018. This item is in the category “Coins & Paper Money\Coins\ World\Europe\UK (Great Britain)\Gold”. The seller is “providentmetals” and is located in Addison, Texas. This item can be shipped to United States. 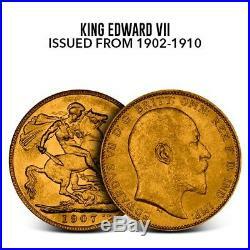 This entry was posted in 8-piece and tagged 8-piece, britain, coin, design, different, eight, gold, great, sovereign, types.